Select Test Volume under Scenario in the tree view to change the number of virtual users and test duration. You can define the total test duration by selecting one of the following options. Limit total test duration: If you select this option, then the total test duration will be equal to a specified time interval (time format is "hours : minutes : seconds"). Duration by profiles: In this case test duration will depend on completion settings specified for profiles. Select a profile in the list of profiles and you will see its settings below the list. Schedule run at: Enables to schedule a test run if, for example, you need to start a test at off-hours. Select a desired date and time and click the Run Test button on the program toolbar. Repeat every: Check this option if you want to repeat the test regularly. Specify any custom period between tests (time format is "hours : minutes : seconds"). Note that scheduled run will be activated only after you click the Run Test button . If the specified time has already passed, the test will start immediately. You can specify all load parameters separately for each virtual user profile. For example, you can join constant, growing and periodic load in the same test. You can also choose a specific load agent for each profile, if you do not want to use the automatic allocation. Select a profile in the list of profiles. Its settings will be displayed below the list. You can specify different start/completion settings for different profiles. These settings will be used if you have selected the option Duration by profiles in the Test start and completion settings above. Run time: Specify the profile run time (in "hours : minutes : seconds" format). Execute _ sessions: Specify the total number of sessions for all users of current profile that will be executed. Complete all open sessions: If you check this option, the program will execute all running user sessions to the end of their profiles. WAPT Pro will complete all open sessions when the time of test run is over, and only after that it will finish the test. The program will also complete open sessions for periodic user load (when the load changes from high to low). This option is useful if you do not want to leave many open sessions on your server after the test. 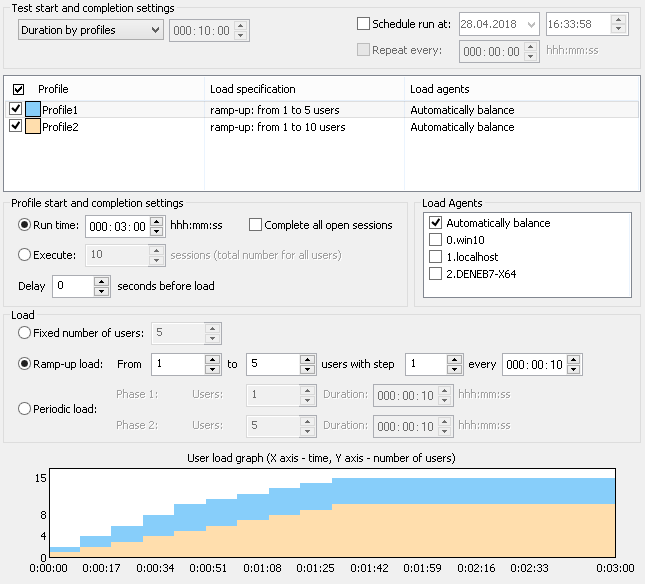 However, requests executed after the end of specified run time are not included in test run statistics. Delay _ seconds before load: This option allows setting a delay before loading a profile. You can specify different delay values for different profiles. For example, you can set a delay 3 seconds for the second profile and 5 seconds for the third profile. So the second profile will be loaded 3 seconds after the test start, and third profile - 5 seconds after the test start. WAPT Pro can emulate 3 types of user load: fixed, ramp-up (or growing) and periodic. You can select different types of user load for different profiles. If you need to make a fixed load on the tested server, you should specify a constant number of users that will be active during the whole test run. All users will start simultaneously at the beginning of the test. Select the ramp-up (or growing) load if you need to perform a test where the number of users is gradually increasing until it reaches a specified maximum. This type of test is useful to see how your site responds to the increasing load volume. Specify initial and maximum number of users and iteration step. You can make a delay on each step before starting the next user; delay value is specified in the every edit box. Periodic load consists of 2 phases repeating several times: one with a low load level and one with a high load level. This type of load is useful to test that web application allocates and frees server resources correctly. Specify the number of users for each phase and set the duration of phases. In the trial version of WAPT Pro, the maximum number of virtual users is limited to 20. Even if you specify greater values, only 20 users will be added to the test. This limitation is removed when you register the product. Automatically balance option (selected by default) means that WAPT Pro will allocate tasks of this profile between all agents participating in the test (checked in the list of agents in the Distributed test run -> Load Agents view). The load will be distributed automatically depending on the resources available on each system. You can choose a specific load agent or several agents for execution of some profile, if you do not want to use the automatic allocation. Select a profile in the table above and put checkmarks for desired agents in the list below. In this case the load specified for the profile will be distributed between agents selected for it. Note that you should select at least one load agent in the list (or click the Automatically balance option) for each profile that will participate in the test. Besides, make sure that all profiles participating in the test are checked in profiles table. You can run the same test with a different set of profiles. You should select at least one profile to start the test. User load graph shows the distribution of users of all selected profiles. Different profiles are shown with the different colors. Profile's color on the graph matches its color in profiles table.